The Social Services and Well-being (Wales) Act 2014 introduced a duty on local authorities and Local Health Boards to prepare and publish an assessment of the care and support needs of the population, including carers who need support. 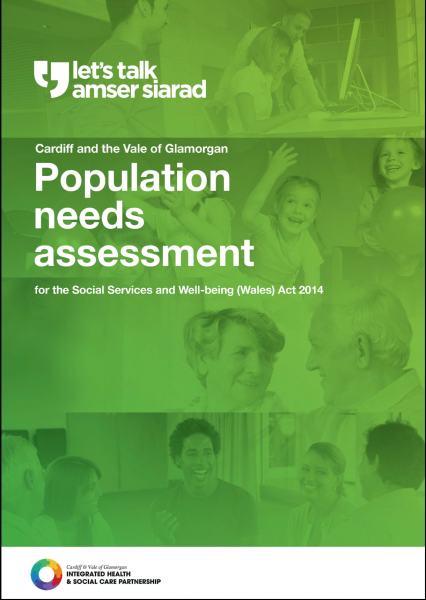 This report details the assessment for Cardiff and the Vale of Glamorgan. Partners from the public and voluntary sectors in Cardiff and the Vale of Glamorgan joined forces under the banner ‘Let’s Talk’ to identify the key care and support needs, prevention issues, and assets (such as people, buildings, organisations or services which contribute to enhancing or maintaining well-being) in the region. An assessment was undertaken between February 2016 and January 2017. Over this time, information was brought together from a number of sources: public surveys tailored to the audience; focus group interviews with local residents; a survey of local professionals and organisations providing care or support, including the third sector; service and population data; key documents; and previous work. The work was overseen by representatives from the City of Cardiff Council and the Vale of Glamorgan Council, and Cardiff and Vale University Health Board, and reported to the Regional Partnership Board for Cardiff and the Vale of Glamorgan. Detailed findings across eleven population groups are presented in the report, along with cross-cutting findings. The report also describes the next steps in addressing the issues raised.